Calling all culture-buffs and heritage-lovers! 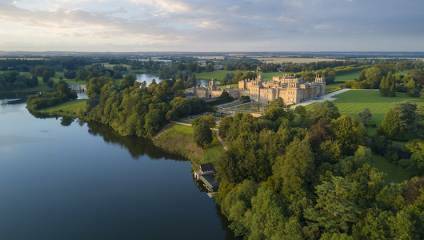 Fancy meandering around the decadent country house and gorgeous grounds of Oxfordshire's Blenheim Palace? We're giving away two annual passes to one lucky Culture Calling reader. As well as hosting the 12th Duke of Marlborough and being the birthplace of Sir Winston Churchill, Blenheim Palace is home to an abundance of baroque architecture, ancient oaks and the renowned Great Lake. You'll not only have unlimited entry to the Palace, Park and Gardens, but you'll also be granted free entry to an array of events, including the Jousting Tournament and The Young Turner Exhibition. Enter to win two annual passes at Blenheim Palace! 5. Offer does not apply to externally organised events at Blenheim Palace. 6. You have the option to donate the cost of your entry to the Blenheim Palace Heritage Foundation Charity to benefit from exchanging to a FREE Annual Pass. 7. This ticket includes access to the Palace State Rooms, Churchill Exhibition, ‘Untold Story’ Exhibition and Park, Formal Gardens and Pleasure Gardens. 8. Blenheim Palace reserves the right to change any of its opening hours, events or offers or to restrict access at any time without notice. You are strongly advised to check the relevant details before visiting.